← Top Ten August Blooms. In a Vase on Monday. Weird Roses. In the politically incorrect days of the early twentieth century, the celebrated plantsman, A.E.Bowles devoted a part of his garden to horticultural oddities and called it ‘ the lunatic asylum’. Here he grew weird plants with ‘mental health issues’ such as the corkscrew hazel. I don’t know whether he grew the unusual Rosa chinensis ‘Viridiflora’ but it would certainly be a suitable candidate for his ‘lunatic asylum’. When we imagine a rose, we think of sumptuous, velvety soft petals in beautiful colours and of course, exquisite fragrance. The green rose doesn’t offer anything like this. It is an aberration, not a modern, man- made one, but rather the result of a chance mutation. It first appeared in 1743. It is odd because all its petals have become leaves. Ok, brace yourselves, this is what it looks like. It has been ignored or reviled and called hideous ever since it appeared. But it was liked enough to be brought into culture in 1856 by a British firm, Bembridge and Harrison and enough people have loved it enough to keep it going ever since. 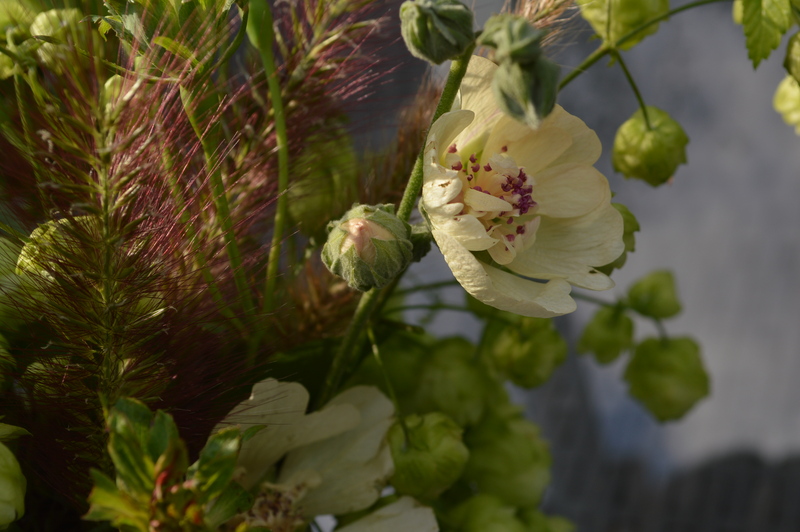 I love any flower with apple green flowers and I like the way these become tinged with bronze as they mature. I also like their tufty, spiky shape and peppery fragrance. So for my arrangement today, I looked for a green vase to display them in and found my Masons Ironstone ‘Chartreuse’ jug. 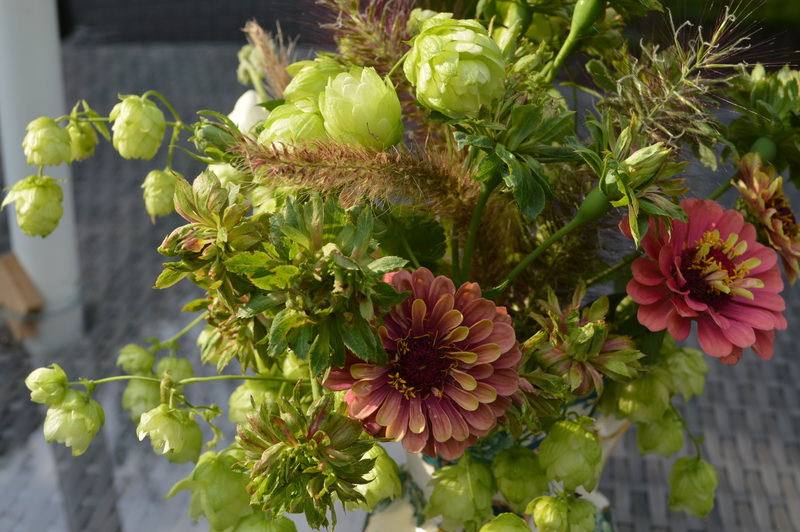 To go with the green flowers I used green hops, Humulus lupulus. These come up everywhere in my garden and are fiendishly difficult to get rid of. But I quite like them at this time of the year for making garlands or for vases. I have grown quite a few zinnias in bright colours this year but I thought the more subtle colour of Zinnia ‘Queen Red Lime’ goes the best with my green roses. I also used a spray of my favourite Alcalthaea x suffrutescens‘Parkallee’. I have quite a few lovely bottle brush grasses, Pennisetum in the garden so these finished off the arrangement. The ones in the above picture are Pennisetum alopecuriodes and the stamens of the hollyhock match it perfectly. So there we have my weird rose. Before you judge it too harshly, if you think of it as an unusual green flower rather than a rose you might like it better. Vita Sackville West couldn’t make up her mind about it but she did concede that it is very useful for flower arranging. 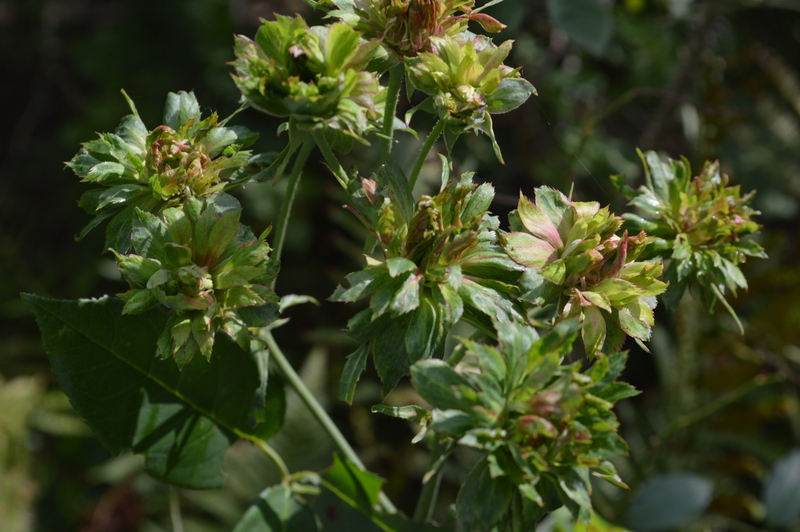 And as it is a China rose it has a long season of flowering. Anyway, I have an affection for eccentricities, be it in flowers or people. 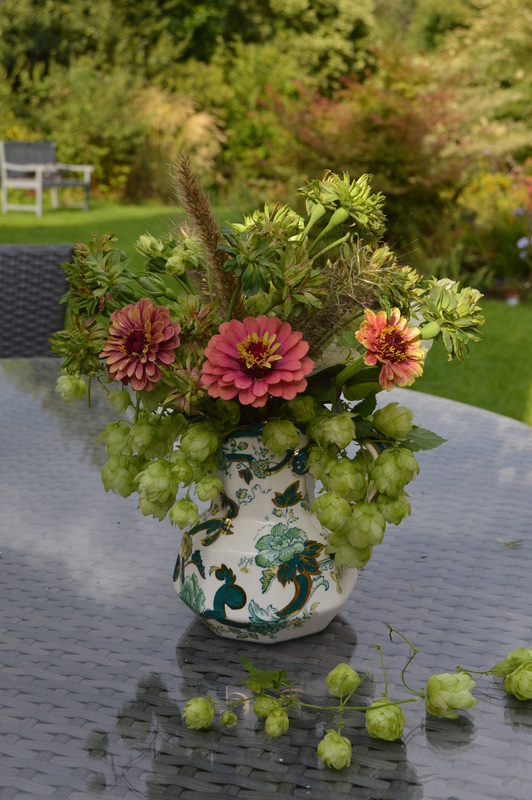 Do pop over to Cathy at Ramblinginthegarden and see the beautiful dahlias in her Vase on Monday and then take a look at all the other vases showing off their September bounty today. 53 Responses to In a Vase on Monday. Weird Roses. Inspired. I can’t decide if I like it either, but agree that it is perfect for flower arranging. I know you love roses as much as I do, but if you can forget that this is a mutant rose and just enjoy its spiky greenness, it is a lovely long lasting flower and great for a vase. I’m with Vita! But certainly it works perfectly in a vase, I can’t quite imagine it in the garden though. I would grow it as chinensis are the about the only roses that grow well for me. The other flowers you put with the rose make it one of the most beautiful of all your vases. Thank you for always surprising us! Thank you Cristina. The thing is you don’t really notice it in the garden unless you are looking for it. But I love it in a vase and it lasts much longer than a proper rose in a vase. Fascinating information from you as always. Your arrangement is so lovely, proving the rose’s worth. Those pale green hops were a brilliant choice as well. Hope all is well with you. Thank you Susie. Yes I am very well, thank you. I have been a bit absent from the blogging world because I have been gardening hard, having fun and enjoying a fabulous summer. I love green roses and have had a bush for years. Ah, you have one, so I am preachinng to the converted! Not many people know about it or like it if they do, so we are a small band of enthusiasts. I got a good deal on several, so I have them in 2 different beds. A friend planted hers in her front yard and someone dug them up. Thank you Dina. Yes, vive eccentricity ! I think you are quite eccentric yourself, in a very lovable way of course. That is why I like you so much. Goodness, yes I wouldn’t allow it in the garden if it had been created by modern hybridisers. Beware of introducing hops into the garden. They seed everywhere and they are very difficult to dig up. I like the green rose – it’s like an ornamental bud. My sweetheart grows it too. 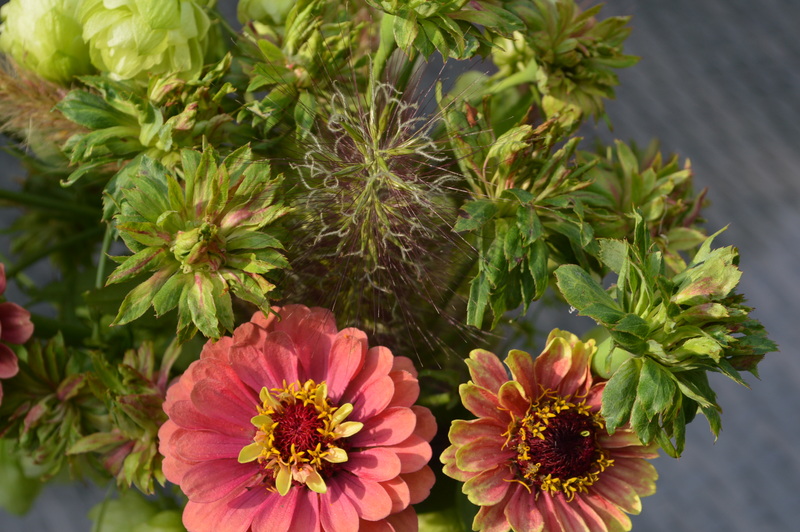 The zinnia is the perfect choice to go with it. I am glad you like it too, Next year I think I will grow green zinnias to go with it. I have never heard of a green rose so thank you for introducing me to it. I wouldn’t grow it myself, but it does look rather splendid in your vase and a perfect companion to the zinnia. I do like curiosities and I agree it is pretty in a vase. You’ve inspired me to use my hops in an arrangement this week, Chloris! You have hops to? They can be a pest but they are fun at this time of the year. I’ve never seen such a rose! I like how you show us many interesting plants in your garden, opening vistas into an under-explored world. Thank you! I love seeking out unusual plants and this one is certainly unusual. I am so glad that you enjoy sharing them. This rose is new to me and I find it both interesting and lovely but then I share your fondness for eccentricities. You’ve chosen a perfect container and companions. Thank you Peter and I know you share my enthusiasm for eccentricities. I would love to live near enough to visit your garden and see your greenhouse. Yes, I know you like quirky too, It’s what makes blogging such fun, sharing our beauties as well as our oddities. I spend my life trying to get rid of hops, they come up everywhere. The golden ones are just as invasive. But at this time of the year when they are looking good I forgive them. I know many gardeners who feel the quirkier the plant the better. I like quirky plants myself, albeit in measured helpings. I love green flowers, though, so I expect I’d be more than willing to adopt this one if I didn’t have such a miserable time growing roses here. The combination with ‘Queen Red Lime’ was perfect. Thank you Kris. Well, this is one rose that probably would grow there, China roses like the sun. I didn’t know there was such a thing as a green rose, and I find it quite fascinating. I think the idea, as you said, is to forget it’s a rose and admire it for its colour and texture. It is perfectly complemented by the zinnias in your vase, which is a triumph of old- fashioned beauty. Thank you Jane. Yes I agree, I think the reason many people hate it is because it is not rose -like at all. I have many beautiful roses so I can allow this one to be different and lovely in its own right. It is really different, but I like it. Especially with the hops and the zinnias. Very nice! Thank you Beth, I’m glad you like it. That is weird. 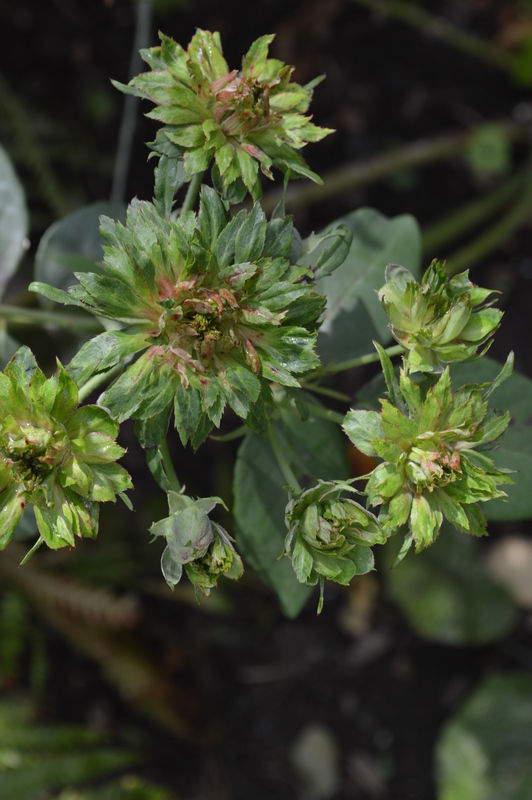 It thought that it was unopened buds of green zinnia. Yes it does look a bit like a zinnia bud, but it’s spikier. 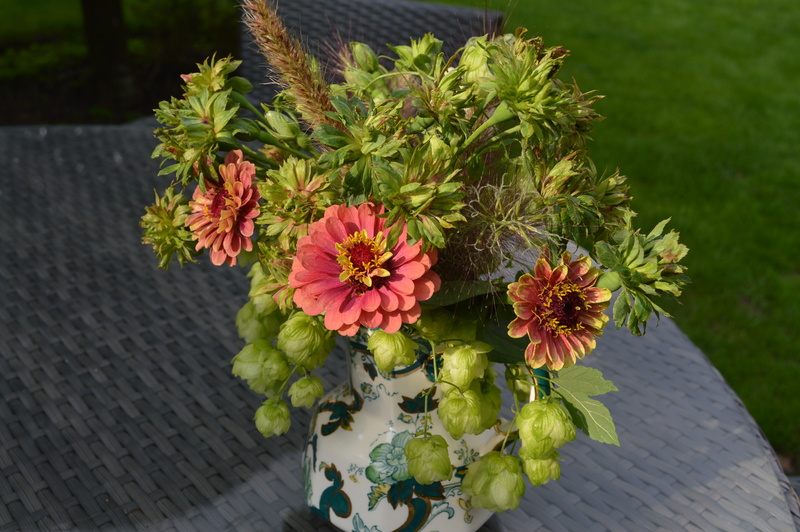 You can almost get me convinced – your photos and arrangement are so lovely, especially with the zinnia/rose/alcathaea combination! Oh thank you, I’m glad you liked it. But I guess from that ‘almost’ that you won’t be looking for one. I shall look out for this everywhere now!!!!! I love this rose. So very different. Oh good, another thumbs up. I am so glad you like it, I thought everyone would hate it. Such an intriguing rose Chloris. I would really like to see it in the flesh. You have chosen its companions well. My golden hop has never been as happy as this year. It’s as if it is on steroids. Perhaps one day you will come to Suffolk and see it here for yourself. I would enjoy that Anna. Yes hops seem to have gone mad this summer. Amazing! I’m glad Bembridge and Harrison kept this oddity going. 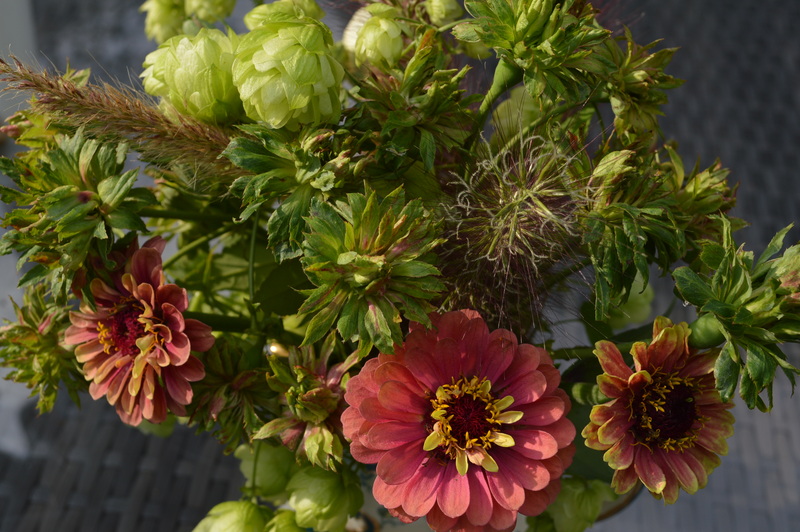 The grasses and hops make the arrangement beautifully seasonal. Thank you Marian. I love the fact that you get such late and long- lasting blooms with this rose. I like the Rose, given my garden full of mad tropicals that should come as no surprise. The hops and Zinnias were nspired choices for accenting the rose. Maybe you could start making beer?! I love seeing your mad tropicals. I love a bit of madness in the garden too. I don’t think any beer I made would meet with the Pianist’s approval. He’s fussy about his beer. Sorry, but that really is a weird rose. I have a dislike of green flowers in any case. Humulus hopulus sounds like a character in a children’s television show. You don’t like green flowers? I love them, I don’t know why. But I know my green rose isn’t to everyone’s taste. It looks like a flower gone wrong, doesn’t it? But I can see its merits (if I get over the fact that it’s a rose!) and it works really well in your beautiful arrangement. Well I suppose it is a flower that has gone wrong. It is very pretty and extremely long lasting in a vase. Well that got us all thinking, didn’t it? I think I would have to see it in real life to judge properly. At the moment the swingometer is past “not sure” and heading towards “not on your Nellie”. Ok, I know it’s not to everyone’s taste. You wouldn’t even notice it growing in the garden, it’s quite insignificant. But I do like it in a vase. Would you like it any better if you didn’t know that it is a rose?